Veeam ONE Business View has been redesigned to improve usability, making it easier to create categories and groups. This allows you to gain business insight across your entire IT environment. One of the many benefits of using Business View is that it allows your environment to become simple to manage and digest from a non-technical perspective. With its recent update, Business View is now accessible within the Veeam ONE Monitor. This enhances Veeam ONE Monitor to be the single tool for performance monitoring, alarms and categorization. In previous versions, creating Business View categories and groups could be confusing and complicated. This has all changed with the newest update, allowing you to engage your infrastructure fully to gather insight into how business investments are being leveraged. If you were using Business View before, the categorization that was defined previously will remain after the update and so will all main Business View features. The main difference is really *how* categorization and grouping is achieved and where it is done. 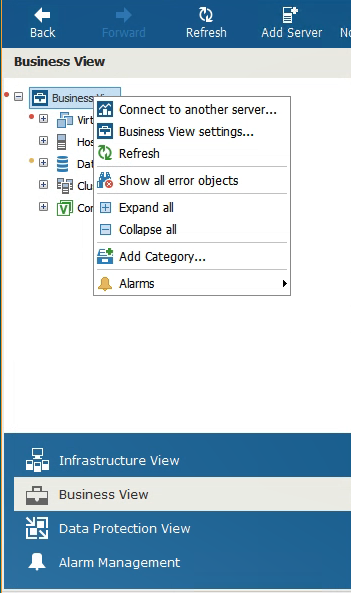 You will notice there is no longer a separate component that needs to be opened to start using Business View, you can now do it right through the Veeam ONE Monitor. This is where you find a dedicated tab for Business View that allows you to start creating groups and categories. In previous versions, this tab was available but lacked the functionality Business View 2.0 brings to the table. With just a right click on Business View you can add categories to your environment. You can choose the category type, whether by VM, Host, Cluster, Storage or Computer. If you are new to Veeam ONE Business View, think of a category as a logical unit consisting of one or more groups. Business View categories can be seen as an overarching business unit that contains multiple, separate departments using different IT resources. 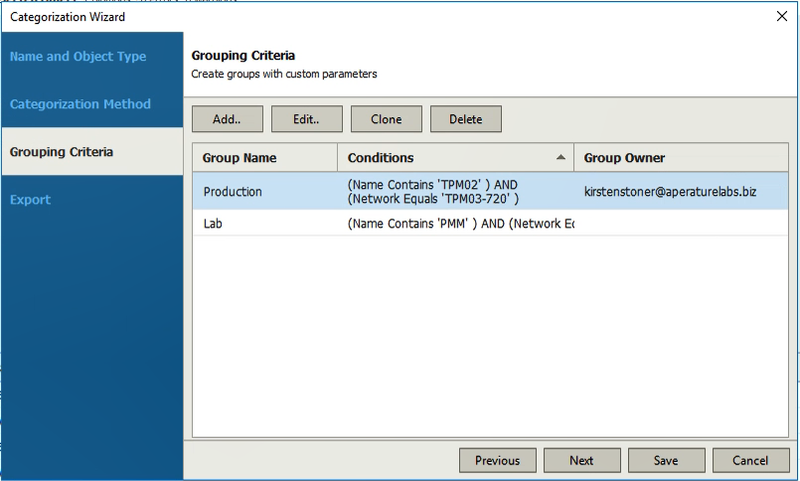 Single parameter allows you to choose a single property on which to base the group. This method is the easiest and fastest way to categorize objects to groups. When creating a Single parameter category, depending on the property you choose, Business View will create different groups based on the defined parameter. For example, if you choose to categorize by network, Business View will automatically sort your VMs by the network they reside on, creating multiple groups based on their network and all under the same category you just created. In the example, we defined the business view groups only by the network the machines reside on, but what if we want the groups in the category to be defined by multiple conditions? The Multiple conditions method allows you to create multiple groups based on several conditions under the same category. This method allows you to not only base your groups on network, but we can add multiple conditions to the group to define it even further to fit our needs. In this example, the category we want to create needs to include groups that are defined by the network the machine resides on and by name of the machine. In the figure above, you can see in one of the groups we want it to include only machines running in the production environment. The other group we want to define to only include lab or test VMs. Business View gives you many different properties on which to base your groups. Figure 4 shows some of the properties available in Business View. In this example, we have decided to base the grouping criteria on network and name of machine. Once you have defined one group, you can add the next group and define it by different conditions. Business View also now supports multiple cardinality. This means one machine can be a part of multiple Business View groups within one category. The third and last categorization method you can use is Grouping expression. Grouping expressions find objects that share common properties. 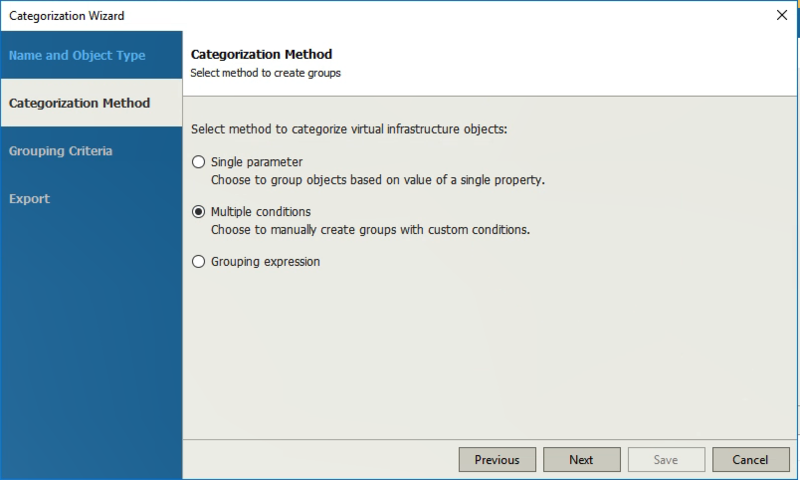 When using this method, Veeam ONE will create a set of groups and include objects that are defined in the expression. This was available in previous versions of Business View, so if you feel comfortable with this and have used it before, it remains an option in this update. Before you exit the wizard, you can decide if you want to set the Group Owner to receive email alerts based on the specific business group that was created. This allows you to assign an owner to each group of categorized objects. Group owners receive customized notifications based on their assigned Business View groups. 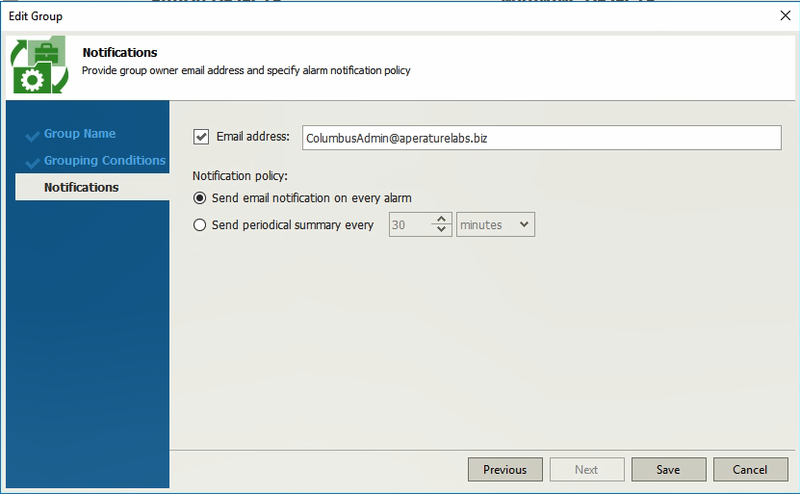 To finish setting up this feature, you will also need to configure alarm notifications so Veeam ONE knows where to deliver messages. This is set under the “Notifications” tab of the alarm settings. For instance, you can set the alarms to notify the Business View group owner that a VM was not protected for the last 12 hours, and if the alarm is not resolved, notify the global admin that the VM still wasn’t protected for the last 24 hours. Business View 2.0 allows you to categorize computers protected by the Veeam Agents as well. Within the Business View tab, there is a new section, Computers. Just follow the same prompts that were discussed previously in this post, and under Category, select Computers. When you get to the point where you need to define grouping criteria, it will automatically filter in agent-based properties as criteria, such as, for example, Protection groups, Backup server, Cluster, and more. If you want to learn more about the new agent monitoring and reporting features, be sure to read this blog post. A great tool for service providers! If you are a service provider and using Veeam ONE, Business View 2.0 allows you to improve your client management and allow for better visibility through Business View groups. Service providers can categorize their environment to align to tiered capacity plans and chargeback. Service providers can utilize Business View to synchronize Business View groups with vSphere and Hyper-V tags. This can also synchronize the creation of tags based on Veeam ONE categorization. This allows service providers to improve client management and visibility. 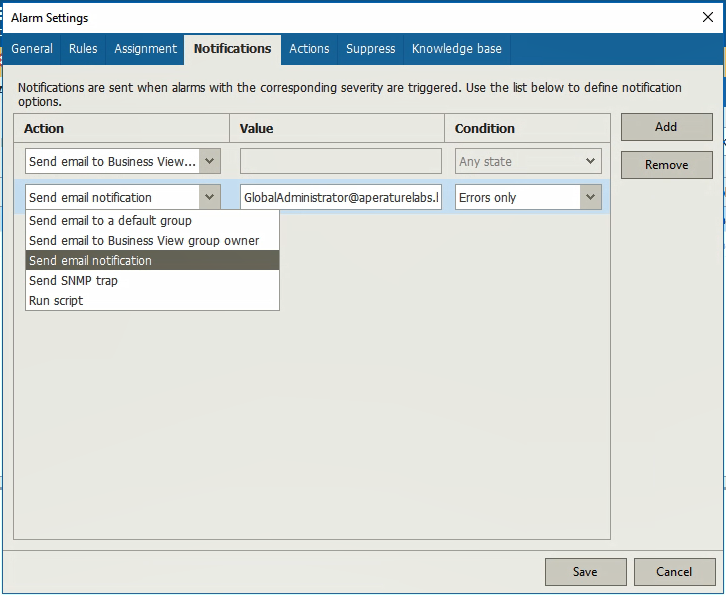 To extend this functionality, Veeam ONE can also assign the group owner role to the groups you create to allow for notifications to be sent to designated admins, which are based on the groups you created. Business View has always been one of the three main components of Veeam ONE, but often under-utilized due to its perceived complexities. With Update 4, Business View is embedded within Veeam ONE Monitor, so you no longer need to open a different user interface to start categorizing and grouping your environment. The restructured Business View has made categorizing as simple as a few clicks of a wizard, whether by single or multiple parameters. It also has the power to assign Microsoft Hyper-V and VMware vSphere tags based on categories users create to enhance the manageability of virtual environments. Take advantage of Business View categorization today with the improved performance and visibility of Veeam ONE Business View 2.0. The post New features of the redesigned Veeam ONE: Business View appeared first on Veeam Software Official Blog. The NEW Veeam Backup & Replication Community Edition is the must-have, FREE solution that provides host-based backup and replication for VMware, Hyper-V and AHV; as well as an agent-based backup solution for Windows and Linux workstations and servers – whether they are physical computers or running in the public cloud. It offers a tremendous set of capabilities and is significantly more powerful than its predecessor (Veeam Backup Free Edition) or any other free backup product on the market. In fact, it is even more powerful than several paid backup solutions offered by other vendors. This is our gift to you and there are no strings attached — you are free to utilize the Community Edition any way you want — be it for your home lab, or for your critical line of business applications in case of IT budget constraints. Download your FREE copy and get started today! If you’re familiar with the history of Veeam, you know that we have always been committed to providing high-quality, functional technology to the tech community for free. It all started with Veeam FastSCP back in 2006 and continues today with many of our products offered for free to tech community members, IT professionals, and home lab users. One product, that has been downloaded more times than any other, is the free version of Veeam’s flagship product, Veeam Backup Free Edition. To challenge the status quo, Veeam has decided to enhance this free edition with a SERIOUS upgrade. Welcome our latest free offering and gift to IT Pros — NEW Veeam Backup & Replication Community Edition. What is Veeam Backup & Replication Community Edition? Simply put, it provides users access to Veeam Backup & Replication Standard edition functionality for FREE for up to 10 VMs or a combination of VMs, physical servers or workstations. How cool is that?! 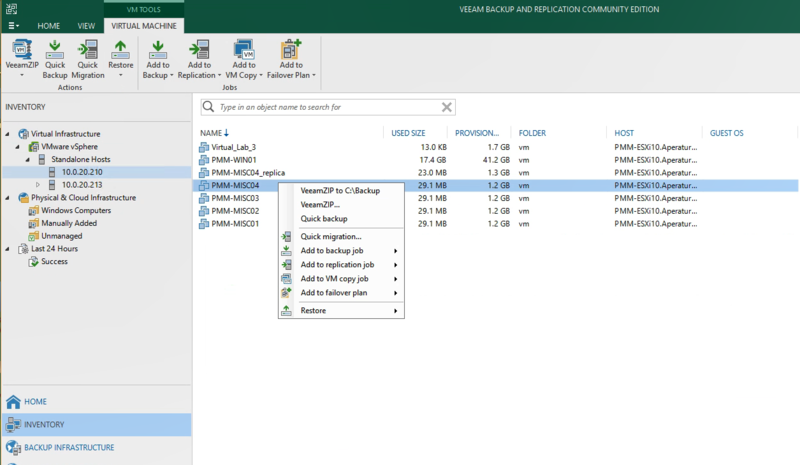 What is NEW in Veeam Backup & Replication Community Edition? Simply put, Community Edition is the next generation of Veeam Backup Free Edition (which has now been discontinued). Veeam Backup Free Edition was quite limited and only included 13 features. While basic functionality was available, users still lacked the ability to schedule backup jobs, utilize replication, and were only able to perform ad-hoc full backups of their VMs. Veeam Backup Free Edition also lacked support for physical computer backup. The good news is, these days are over! Community Edition now provides ALL the features offered in our paid Standard edition (see feature list here) at no cost, with the most significant added capability being able to perform incremental backups and scheduling backup jobs without needing to use PowerShell, which historically has been seen as the biggest drawback for our Free Edition users. Next, as the difference in the name implies, Veeam Backup & Replication Community Edition provides VM replication functionality for those few, most important VMs that require the fastest restore in case of a disaster. Finally, the biggest game changer is protection for physical servers and workstations, enabling you to protect all your workloads from a single console. And best of all — it’s completely free, including for production use! Let’s discuss some of the features that are now available for free in more detail. The ability to schedule backups without using a PowerShell script is a great feature addition that was not available in the previous free offering. Users can now easily use the wizard to schedule their jobs to run automatically based on a defined schedule. To achieve low recovery time objectives (RTOs) for your most critical VMs, Community Edition users gain the ability to utilize VM replication. Replication allows you to have an exact copy of the VM in a ready-to-start state. In fact, you don’t even need the backup server to be available to get those replicas going, which can be important in a site-wide disaster! Just power them on using hypervisor’s native management console. For workloads with less strict RTO requirements, the new ability to utilize backup copy jobs is useful in helping achieve the 3-2-1 rule. The 3-2-1 rule states you should have 3 copies of backups, on 2 different media, one of which should be offsite. By being able to copy your backups locally, or to a remote site, you can be sure you’re prepared for the worst. Application awareness is yet another key Veeam functionality included in Community Edition, offering an important technology for proper backup of enterprise applications. An application-aware backup ensures that your data is consistent and performs application-specific steps at the time of backup to ensure that the entire computer restore is performed according to the application vendor’s guidelines. In addition, Veeam Explorers for Microsoft applications (Active Directory, Exchange, SQL Server and SharePoint) offer users the ability to quickly find and recover individual application items, thus helping you avoid having to roll back the entire computer image to the latest restore point. Community Edition also provides users the additional ability to centrally deploy and manage Veeam Agents for Microsoft Windows and Linux on any computer running in your environment, whether they are physical or cloud machines. This eliminates the need to install, set up, update and manage individual Veeam Agents on every machine. You can simply deploy the agents from the Community Edition backup console to the physical machines in your environment that you want to protect (with limits for protecting up to 10 instances – where workstations consume 1 instance and servers 3 instances each). So, once you exceed 10 instances, what can you do to protect the remaining VMs? While you gain Standard edition functionality with Community Edition for up to 10 VMs, you will still be able to utilize VeeamZIP for those extra VMs that don’t quite make the 10 instances ceiling. Yes, just like before, we still allow you to protect an unlimited number of VMs with VeeamZIP for free. You’re probably wondering how does this work? Once 10 instances have been consumed, you will no longer be able to utilize the extended functionality included in Standard edition and when you try to run additional backup jobs, they will fail stating that the license has been exceeded. 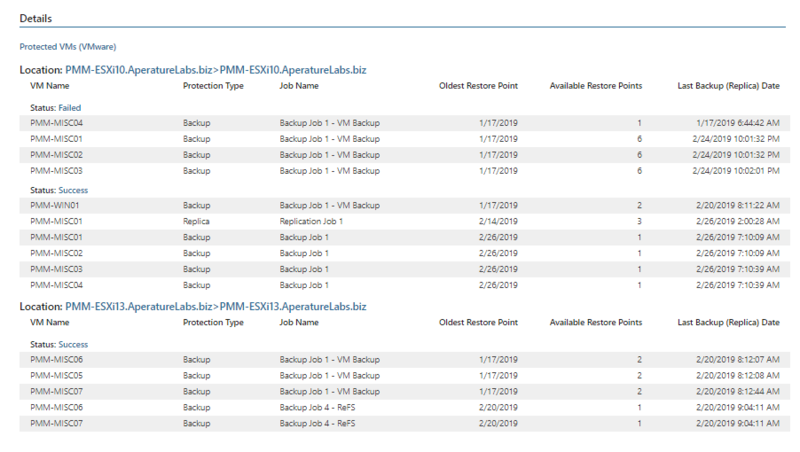 So, be mindful and selective of the VMs you are protecting with fully featured backup jobs — make sure you use the first 10 instances for your most important VMs, which actually do require strict RPO. And for the rest of less important VMs, you can still use VeeamZIP! If you are not familiar with VeeamZIP, it’s a simple way to take an ad-hoc backup of a VM. VeeamZIP will retrieve the VM image, compress it and store it as a full backup file (.VBK), acting as a single restore point. Note that when using this option, you don’t have an option to perform incremental backups. Also, keep in mind that at this time, VeeamZIP is supported for VMs only. We recognize that it is hard to justify installing a Community Edition backup server when you only have one or two computers to protect. Because of that, we also provide Veeam Agent for Microsoft Windows and Veeam Agent for Linux as standalone offerings – and of course, we offer completely FREE versions of these as well. You can install these products directly on the machines you need to protect and start performing backups to any storage you have in less than 5 minutes! The only thing you lose in this case is centralized management, but if you only need to protect a couple of machines, centralized management may not be all that necessary. Wait, there’s more FREE software! NEW Veeam Backup & Replication Community Edition isn’t the only free product being upgraded for our community of loyal followers. Veeam ONE, our monitoring and reporting solution, also has a new Community Edition that you can download and use for free in your environment. If you want to know which VMs are protected, and which are not, then our Protected VMs report from the Veeam Backup & Replication report pack is here to help. 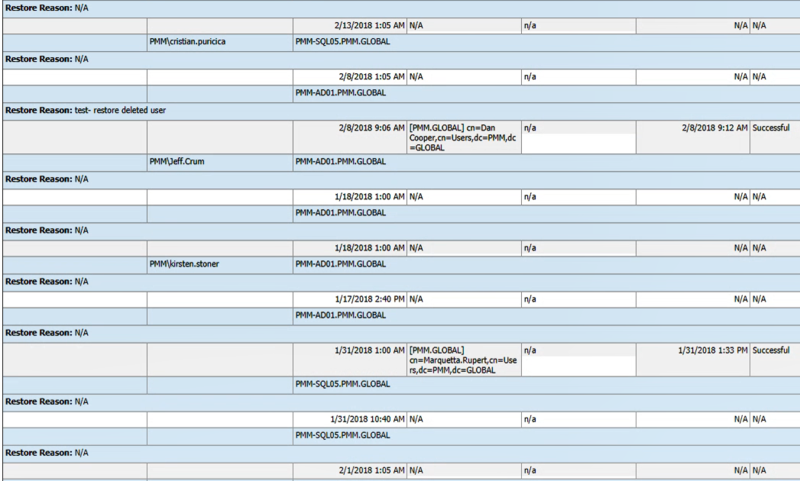 Not only does this report list all VMs that have backups within a defined recovery point objective (RPO), but it also shows which VMs lack backups. You can even review the reason why some VMs are unprotected. For example, if you provisioned a new VM and forgot to add it to the backup job, Veeam ONE will spot this and will immediately inform you about this via the Protected VMs report. NEW Veeam ONE Community Edition does not have any limitations on the number of VMs you can monitor in the virtual infrastructure. This has been true with Veeam ONE Free Edition and remains the same for Community Edition, but now we give you even more features! In addition to the ability to identify performance bottlenecks in your virtual infrastructure, you can now make decisions right in the Veeam ONE UI to resolve these issues via our NEW Remediation Actions that are available to ALL Veeam ONE users. These actions can do things like automatically remove an orphaned VM snapshot or add an unprotected VM to a backup job with a single click! As you can see, NEW Veeam ONE Community Edition together with NEW Veeam Backup & Replication Community Edition are like peanut butter and jelly! Before you go… even more free software! Another FREE product we recently released for production use is Veeam Backup for Microsoft Office 365 Community Edition. If you are utilizing Office 365 and looking for a solution to protect your data, this is a must have. This FREE offering allows you to back up Exchange Online and OneDrive for Business data for 10 users, as well as 1 TB of SharePoint Online data. This is enough to protect the data for yourself and your entire executive management team — which will levitate you to hero status when they experience data loss (which is not a question of IF it will happen, but WHEN). It’s a great opportunity to protect your most important data in Office 365 from accidental deletion, security threats and retention policy gaps. Learn more here. 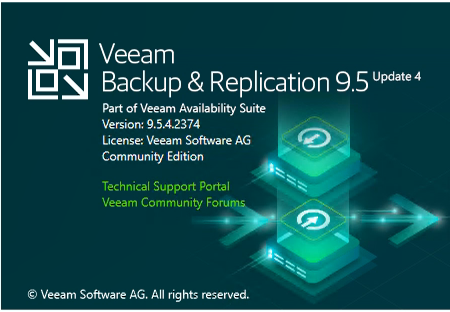 The post Veeam Backup & Replication <em>Community Edition</em>: Our latest gift to the community appeared first on Veeam Software Official Blog. Veeam ONE has many capabilities that can benefit your business, one of which is the ability to run reports that compile information about your entire IT environment. Veeam One Reporter is a tool you can use to document and report on your environment to support analysis, decision making, optimization and resource utilization. For those who have used Veeam ONE in the past, it’s the go-to tool for reporting on your Veeam Backup & Replication infrastructure, VMware vSphere and Microsoft Hyper-V environments. But one thing was missing from Veeam ONE, and that was the depth of visibility it provided for the Veeam Agents for Microsoft Windows and Linux. 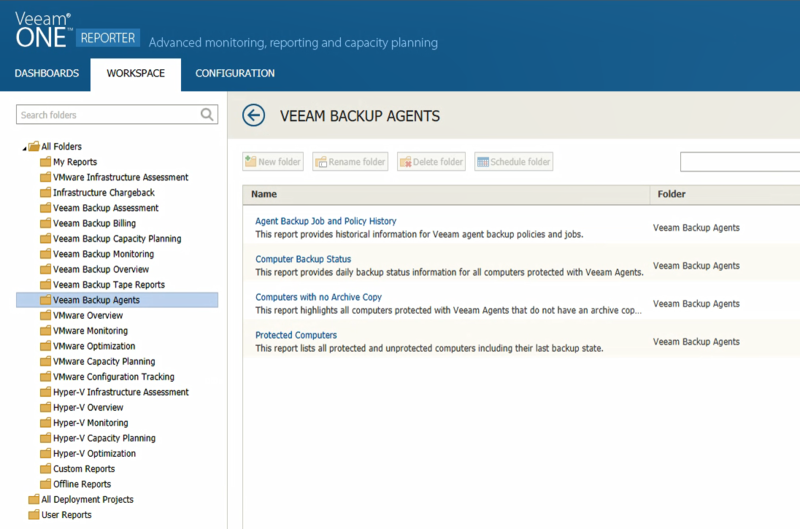 With the latest update, Veeam ONE Reporter gains three new reports that assess your Veeam Agent Backup Jobs. 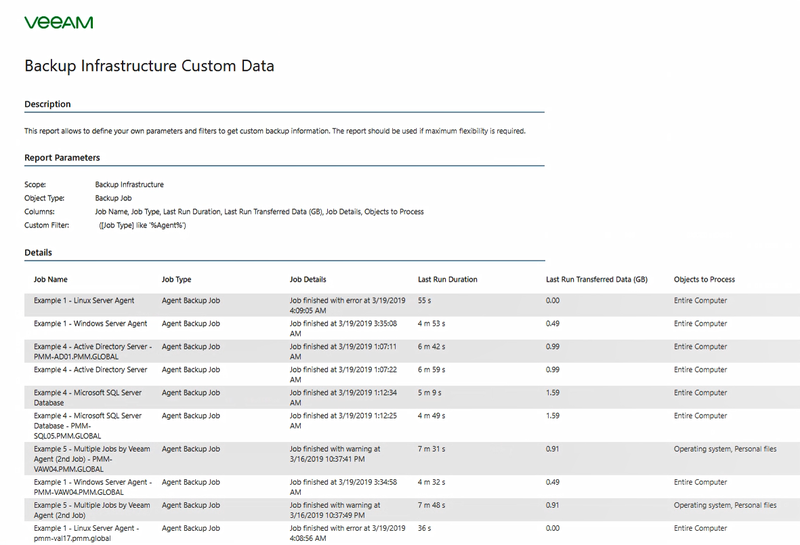 In addition to these predefined reports, the update brings information about computers to the “Backup Infrastructure Custom Data” report. It provides agent monitoring by being able to categorize any machine that is being protected by the Veeam Agent within Veeam ONE Business View, allowing you to monitor activity from a business perspective. Ultimately, this update aligns Veeam ONE to provide substantial reporting and monitoring for any physical machines that are protected by the Veeam Agent. Veeam ONE Update 4 adds more predefined reports to analyze Veeam Agent Backup Job activity. These include, Computers with no Archive Copy, Computer Backup Status and Agent Backup Job and Policy History. The “Computer with no Archive Copy” report will highlight all the computers that do not have an archive copy. The “Computer Backup Status” report provides the daily backup status information for all protected agents. 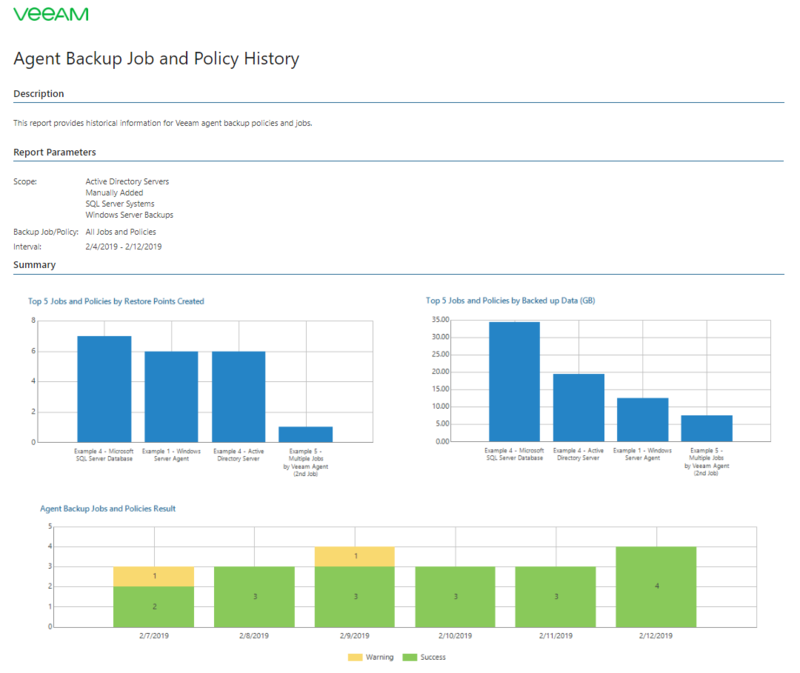 The “Agent Backup Job and Policy History” report provides historical information for all Veeam Agent policies and jobs. All these reports provide visibility into evaluating your data-protection strategies for any workload that is running a Veeam agent in your environment. 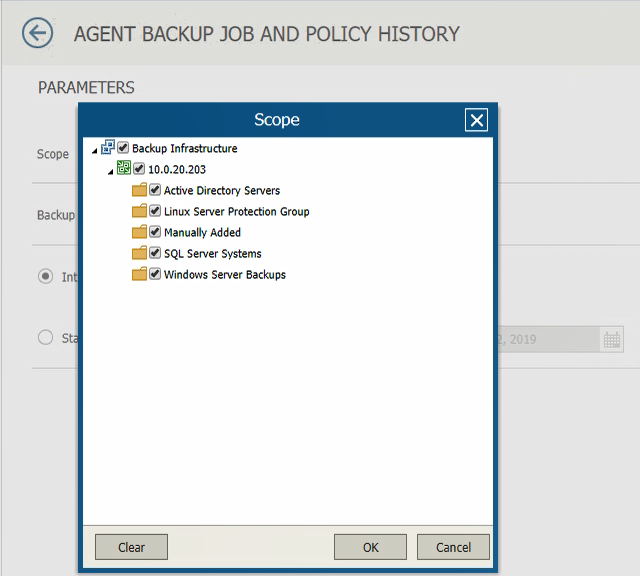 In this post, I want to highlight the Agent Backup Job and Policy History Report as well as discuss the addition to the “Backup Infrastructure Custom Data” report because both provide a great amount of information on Agent Backup Jobs. Open Veeam ONE Reporter, switch to Workspace view, and find the Veeam Backup Agent Reports folder, this is where you will see all the pre-built reports available for Veeam Backup Agents. Once you have made your decision, click Preview Report and the report will be created. The report contains historical information for your Veeam Agent Backup Jobs. How you defined the report in the first step will determine how specific or general the data will be. Either way, the report provides great depth of data. 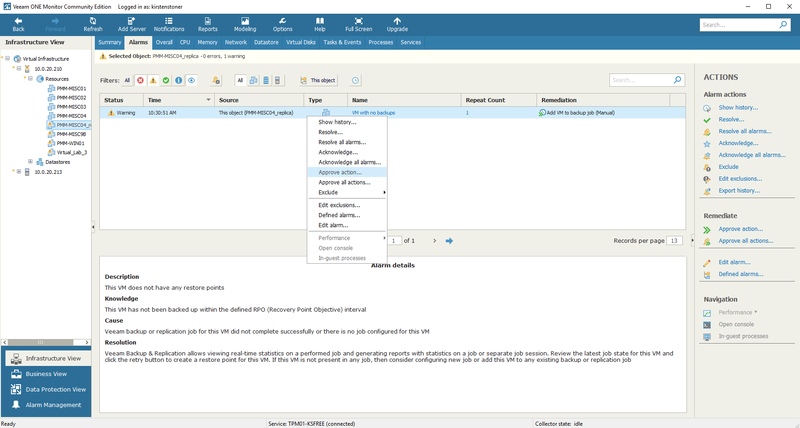 The first page shows an overview of the Agent Backup Job and policies, the date the jobs were run, and if it is in the Success, Failed or Warning category. On the second page of the report, you can see a bit more details like the Total Backup size and the amount of Restore Points Created. 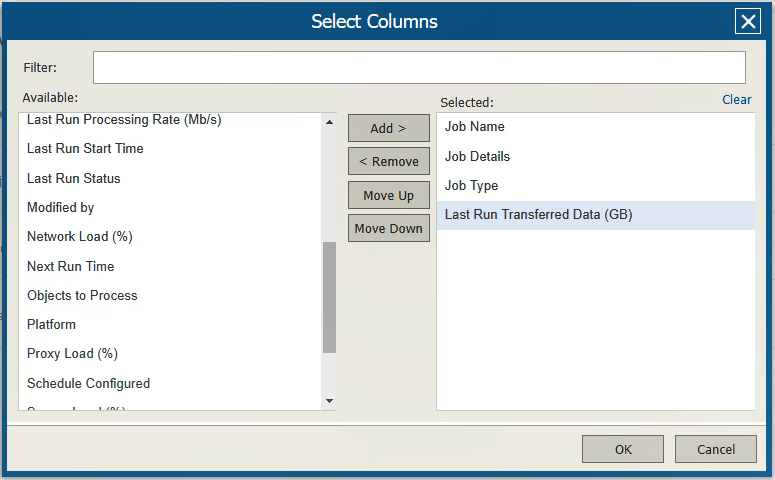 If you select a specific date when the job was run it gives even more analysis on the specific run of the backup job. This tells you when the job started, how long it took and backup size. You can even tell if the run was full or incremental. The report provides visibility into your IT environment by being able to gather real-time data on your protected agent backups. This report allows you to customize and add data protection elements that are not covered together in the predefined reports included in Veeam ONE. The report can define and display data points about Veeam Backup & Replication objects, including backup server, backup job, agent job and VMs. This is useful because it allows you to create a report that includes aspects of the backup infrastructure of your choosing to be displayed for easy analysis and visibility. To run this report, much is the same that was discussed previously in this blog post. You will need to locate the custom report pack in the workspace view, once found you will be able to choose between the different objects you want to show and what aspects of the backup infrastructure you want the report to analyze. When creating the report, you have the option to choose between different aspects of the backup infrastructure you want to be shown. In addition, you can apply custom filters to have the report filter the data to show only what you want it to. This allows you to create custom filter for the selected objects you want to show. 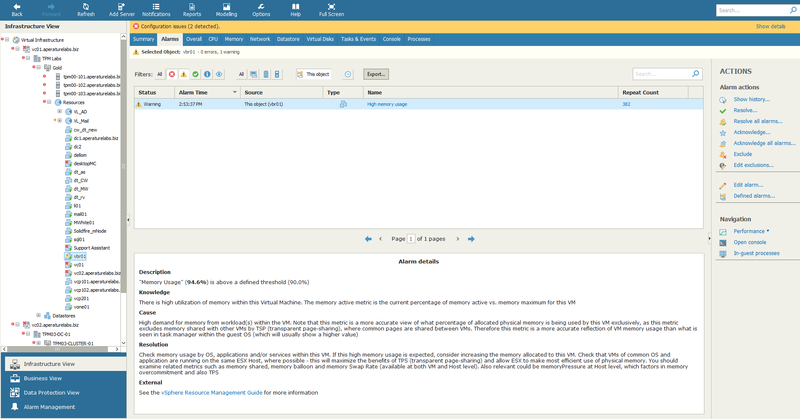 Here is an example of a report that was run using the custom report pack. The ability to create custom reports allows you to define your own configuration parameters, performance metrics, and filters when utmost flexibility is required. How cool is that? To assist with monitoring Veeam Agent Backup activity, you can utilize Veeam ONE Business View. Veeam ONE Business View has added the ability to categorize agents in business terms. If you have your backup server(s) connected into Veeam ONE, you can start categorizing any machine that is being protected by the Veeam Agent. Veeam ONE Business View allows you to group any computers running the Veeam Backup Agent managed by your backup server. This gives you another layer of monitoring for the Veeam Agents that was not available in previous versions of Veeam ONE. Veeam ONE gives you the tools needed to accurately monitor and report on your entire IT environment. Actively monitoring and reporting on your IT environment allows you to be proactive when addressing issues occurring in your environment, helps plan for future business IT operation needs, and provides understanding on how your data center works. By being able to add Veeam Agent Reporting to your physical environment, you can gather data points on the Veeam Agent backup jobs and document the results. The latest update brings to Veeam ONE many enhancements and functionality making it imperative to start using in your data center today. The post Enhanced agent monitoring and reporting in Veeam ONE appeared first on Veeam Software Official Blog. Microsoft SharePoint is an invaluable tool used by organizations worldwide for data sharing and collaboration among teams. SharePoint provides businesses with a way to increase teamwork and productivity to streamline their processes and improve their business outcomes. There are several deployment options available for SharePoint, such as on-premises, online through Office 365 or a hybrid deployment. Each option has its own benefits, however, this blog post focuses on Veeam Explorer for SharePoint being used in an on premises deployment model of Microsoft SharePoint. If you’re using SharePoint online, Veeam Explorer is available to you as well through Veeam Backup for Microsoft Office 365. An on-premises SharePoint farm could consist of multiple servers with each server needing to remain operating to meet your end user’s expectation. To meet a user’s demands, it’s important to have an Availability strategy in place. Veeam meets these expectations by giving you the technology to browse the database, restore individual items, and gain instant visibility while still being easy to use. 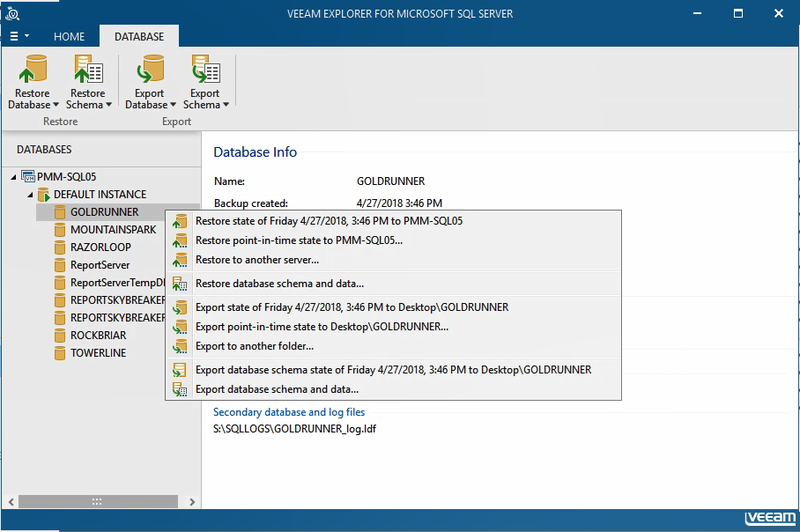 Veeam has developed many powerful built-in Explorers in its software, and Veeam Explorer for Microsoft SharePoint is no different. From the Veeam backup of your SharePoint server, you gain the ability to browse the content database, recover necessary items without having to fully restore, and start the virtual machine hosting the content database. Like the other Veeam Explorers, this tool is available with all editions of Veeam Backup & Replication, even the Free Edition! When you perform a backup of your SharePoint Server, remember to enable Application Aware Image Processing. This technology creates a transactional-consistent backup to guarantee the proper recovery of your applications running on VMs. Once you successfully created the backup or replica of your SharePoint Server, you can start using the Explorer. There are a couple options available to you when using the Explorer, these include: browsing the SharePoint database, restoring individual SharePoint items and permissions, exporting items (sending as an email attachment or saving them to another location), and the ability to restore SharePoint sites. 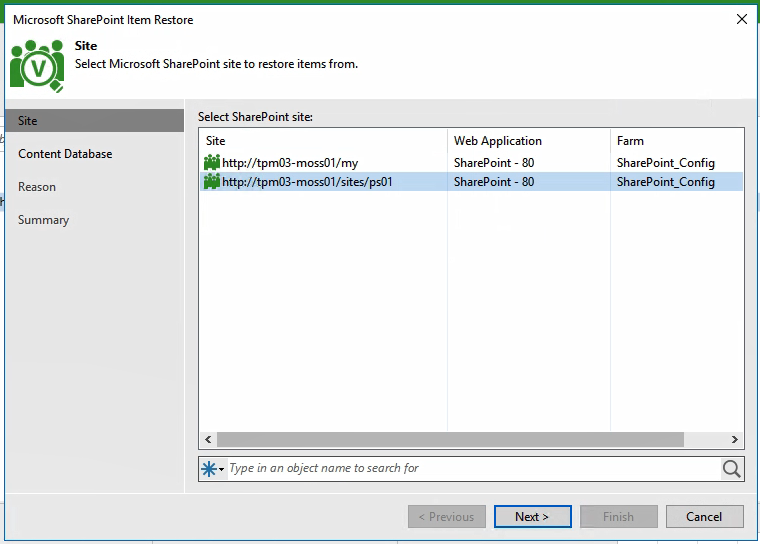 Once you’re ready to perform a recovery, the application item restore wizard will auto-discover the SharePoint farms that were backed up and initiate the mount operation. During this operation, Veeam Backup & Replication retrieves information about SharePoint sites, the corresponding database server VMs, and restore points. When first initiating the restore, the wizard shows you the list of available sites included in the backup, allowing you to choose which site you want to explore to find the items you need. The Application Aware Image Processing technology is how Veeam Backup & Replication auto-discovers the information about your SharePoint Servers. 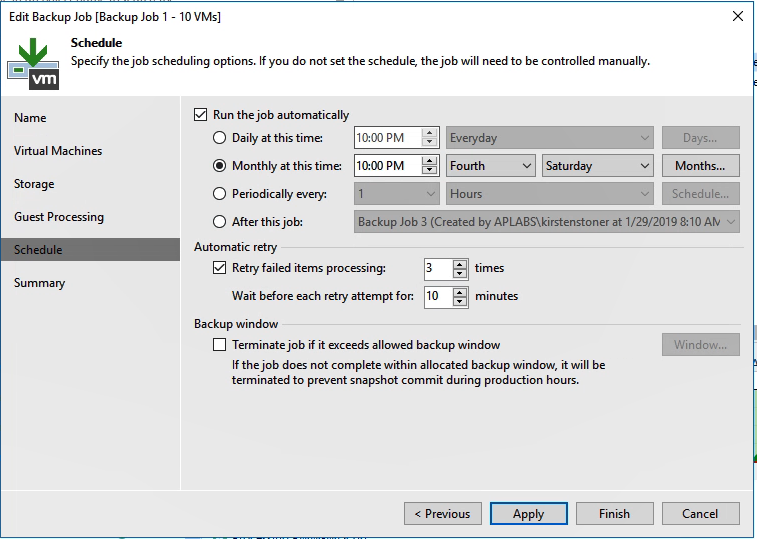 It is important to remember to select this option when first performing the backup. Within the Explorer itself is where you can view the content databases, sites, subsites, libraries and lists. Depending on what you select, you can browse and view its contents to find what is needed to restore. If your restoring a document, you can even open and preview the document to ensure it’s the correct item needed to recover. Available in all the editions of Veeam Backup & Replication, Veeam Explorer for Microsoft SharePoint delivers granular browsing and search capabilities to find any item or multiple items stored in any number of Microsoft SharePoint databases. To support this capability, the guest file system of the VM is mounted directly from the backup to a staging Microsoft SQL Server. By default, Veeam will use the SQL Server Express instance that was installed when you deployed Veeam Backup & Replication. One thing to note, the staging system must be compatible or the same version as the Microsoft SQL server that hosts the Microsoft SharePoint Content databases. If it is not, you will need to identify a staging SQL Server that is compatible to be able to use the Explorer. This is available within the Veeam Explorer options, under the SQL Server Settings tab. For detailed instructions on this functionality, please refer to the user guide. With the amount of visibility Veeam Explorer for Microsoft SharePoint provides, you may want to be able to keep track of who is accessing the Explorer, what they are looking at, and why they are performing restores. For this, Veeam offers another layer of visibility, especially when it comes to restore operations. This visibility comes in the form of Veeam ONE, specifically the Restore Operators Report allowing you to safeguard your data with the ability to see who is accessing your data, where it is being restored to, and what items are being restored. Veeam offers powerful, useful tools to ensure Availability for your business. Sometimes, we need to take an extra step to ensure we are still meeting the security requirements for the business as well. 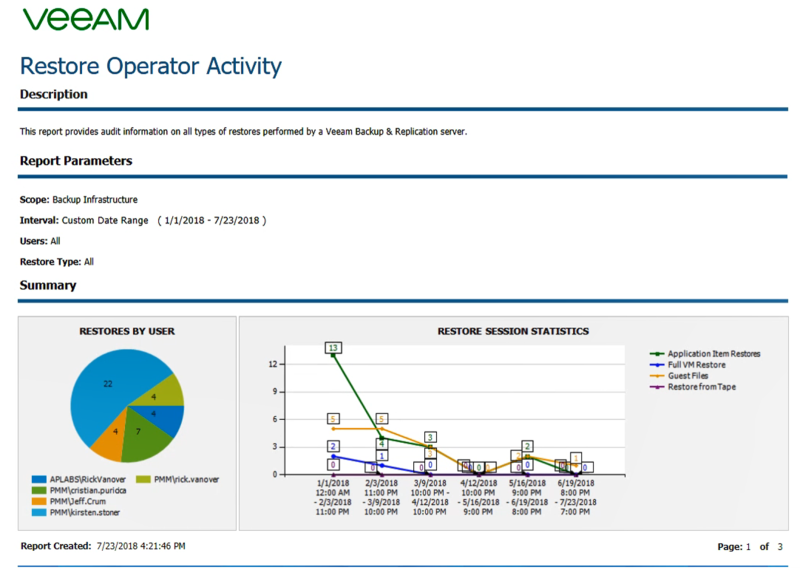 Veeam ONE’s Restore Operator’s Report gives you a detailed description of who is accessing your backup data and what restores they are performing or not performing. This allows you to gain an extra layer of visibility by being able to view all types of restore actions performed across the Veeam Backup Servers. The above report shows who is accessing the backup data and what restores they are performing. This is an easy way to ensure that the correct people who have permission to be accessing certain data, are only accessing that data when and how they’re supposed to. The above image shows the different users performing restores and what type of restore it is, if its application, full VM, files, or even a restore from tape. Going deeper into the report, you can see which VMs the users are accessing and what restores they are performing, or if they’re even performing a restore. This report is very useful to double check to ensure your users are only accessing what they should be accessing. Microsoft SharePoint is a valuable tool used in organizations today to increase collaboration among teams to improve teamwork and organizational knowledge to be able to make better decisions. Veeam Explorer for Microsoft SharePoint allows you to keep your business’ most important applications available to meet your end users demands. An added benefit is this Veeam Explorer for Microsoft SharePoint is even included in Veeam Backup Free Edition — allowing you to start using this powerful technology today! 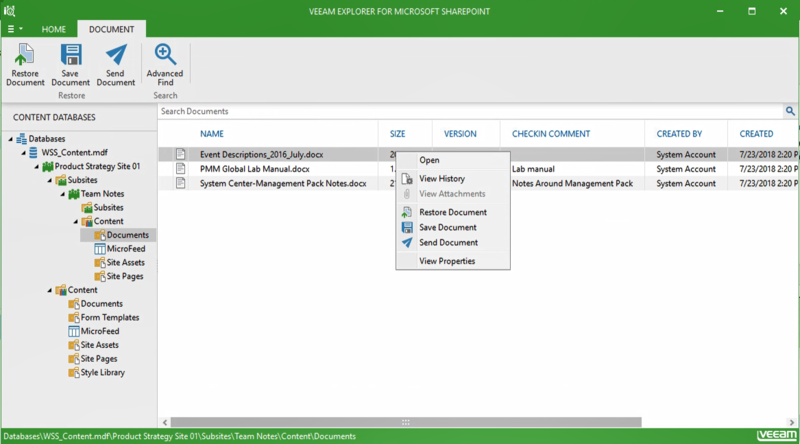 The post Instant visibility & restore for Microsoft SharePoint appeared first on Veeam Software Official Blog. 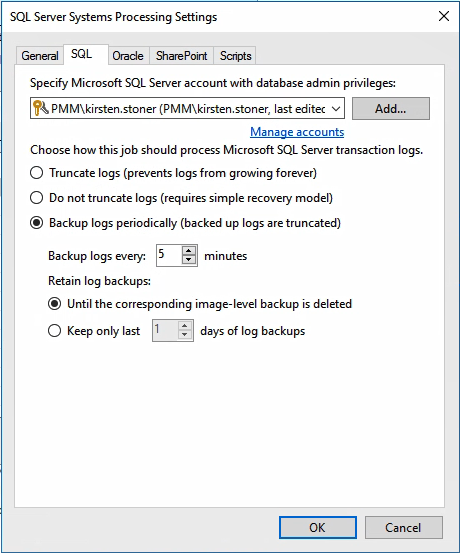 The post Tips to backup & restore your SQL Server appeared first on Veeam Software Official Blog. If you are responsible for meeting strict Recovery Point Objectives (RPOs) for your business, snapshots are the technology you need. Snapshots are appealing because you can make quick, point-in-time copies of your data, with little-to-no impact on production storage. This allows you to take multiple snapshots throughout the day. One of the key players in snapshot technology is NetApp, which gives storage snapshots added functionality through its SnapMirror and SnapVault. When you add Veeam into the mix, you gain a comprehensive Availability strategy that meets, not only RPOs, but also Recovery Time Objectives (RTOs). Data Availability today is more critical than ever before and being able to leverage storage snapshots is a real game-changer when it comes to meeting the demands of your business. Veeam and NetApp integration provides you with the ability to create faster backups, quicker restores and improved protection. Veeam integrates with NetApp FAS and AFF, FlexArray (V-Series), Data ONTAP Select and IBM N Series (NetApp FAS OEM). The Veeam and NetApp combination gives you useful tools such as Backup from Storage Snapshots, Veeam Explorer for Storage Snapshots and On-demand Sandbox for Storage Snapshots. Backup from Storage Snapshots lets you use a snapshot — which can be taken every 15 minutes — to create a backup without affecting production. What takes this functionality even further is the added benefit of SnapMirror and SnapVault, from which you can also use to take backups. I know I mentioned SnapMirror and SnapVault before, but to be clear, SnapMirror is a NetApp technology that allows users to create a mirror of a snapshot on a different NetApp storage array. This could almost be termed as replicating a snapshot to a different array. SnapVault allows you to create a read-only copy of your data. Both technologies can help deliver the #1 Data Availability guideline users follow today: the 3-2-1 Rule. By combining NetApp and Veeam technologies, you can easily achieve the 3-2-1 Rule with Veeam Backup from Storage Snapshots. It’s true that a backup is only as good as its recovery. In other words, the worst thing that can happen is when you go to restore and find you are unable to utilize your backup due to an unforeseen circumstance. This situation could easily ruin your day or even your career! Veeam delivers Veeam Explorer for Storage Snapshots, utilizing snapshots to perform quick restores so you can meet RTO requirements easily. Veeam Explorer for Storage Snapshots also has the functionality to utilize SnapMirror and SnapVault as a source for restores. Veeam Explorer for Storage Snapshots provides Instant VM Recovery, VM Guest file restores and the ability to restore from Microsoft applications like SharePoint, Active Directory or Exchange. The technology can also perform restores for SQL databases and Oracle. What makes this offering even more perfect is that you can utilize the Explorer for FREE! Veeam now wants to give you a way to maximize your storage investments to the fullest. This leads us to the next capability, Veeam DataLabs for Storage Snapshots, which allows you to utilize a storage snapshot to create a lab environment, so you can troubleshoot problems, test software patches and install new software. This lab is fully fenced off from the production environment, so it allows you to do your testing for processes before implementing into your production environment. This Veeam feature requires NetApp FlexClone and is an added value to your NetApp investment. Veeam combined with NetApp Storage solutions can give you a Data Availability strategy that will help you meet the increasing demands of your business today. Backup from Storage Snapshots gives you fast backups. Veeam Explorer for Storage Snapshots provides quick restores. The ability to create a virtual lab through a storage snapshot takes your business to the next level when it comes to leveraging storage investments. Don’t forget that Veeam Explorer for Storage Snapshots is FREE, giving you world-class restore capabilities from a storage snapshot with no additional cost! The post Accelerate recovery with NetApp snapshots and Veeam appeared first on Veeam Software Official Blog. Veeam & HPE take recovery to the next level with storage snapshots! Back up is the first step along the journey toward data Availability and backing up data is a day to day task many of us do without knowing it. The real value in those backups is achieving efficient and fast recovery to meet the crucial demands of the business. Over the years Veeam has become synonymous with data Availability and with the integration with Hewlett Packard Enterprise (HPE) storage, users gain industry-leading recovery capabilities to minimize data loss. This integration allows storage snapshots to become more purposeful through Veeam Explorer for Storage Snapshots, Backup from Storage Snapshots and On-Demand Sandbox for Storage Snapshots. Veeam Backup & Replication integrates with HPE 3PAR, Nimble and StoreVirtual snapshot capabilities to create a highly-available, cost effective, efficient environment for storing, protecting and recovering data. I mentioned that backup was the first step in the journey of data Availability; automation is another step on that journey. The automation part comes here in the form of being able to take those storage-efficient snapshots and put them to use by way of offering them out to development teams in an isolated sandbox environment. The use of the On-Demand Sandbox for Storage Snapshots allows users to test VMs, troubleshoot issues, and perform testing scenarios. If you are already familiar with the On-Demand Sandbox feature, the set-up to utilize the snapshot integration will be similar. You will need to configure a virtual lab, Application group and a SureBackup job. Leveraging storage snapshots through the On-Demand Sandbox is not the only way you can utilize this snapshot technology. 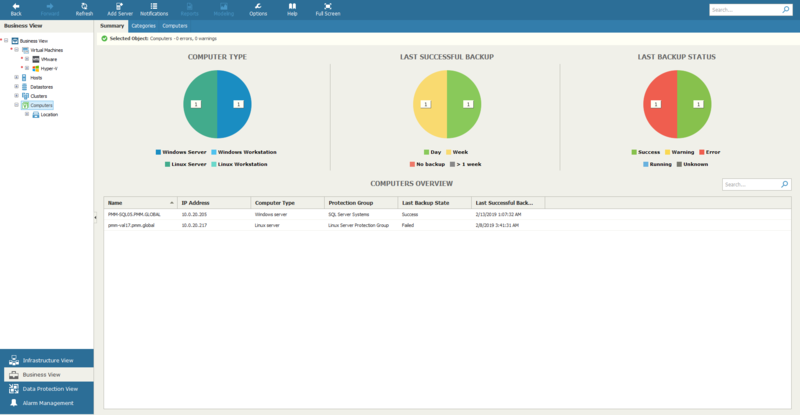 Backup from Storage Snapshots is a way to optimize and enhance VM backups in an easy way. This technology reduces the impact on production data and allows for non-disruptive backups of VMs. With HPE 3PAR and with Nimble Secondary Flash Arrays, Veeam can provide backup from a secondary storage array to reduce impact on the production environment even further. For Nimble environments, the introduction of the HPE Nimble Secondary Flash Array allows users to utilize this array to be used as a source for backup jobs, eliminating any performance hit on the production infrastructure during the backup window. The backup from the Nimble Secondary storage array is asynchronous, meaning the snapshot is first triggered on the primary array then copied or replicated to the secondary storage array. Snapshots and their replication between the primary array to the secondary array can be orchestrated through Veeam Backup & Replication. Should you want to learn more about Veeam’s integration with Nimble, this blog post is a great source to start. For HPE 3PAR StoreServ, the technology is a little different but can achieve the same outcome. To achieve this with an HPE 3PAR StoreServ array, you need to configure a peer persistence relationship between the two. It’s one thing to be able to offer backup from storage snapshots but to be able to leverage synchronous storage replication technology allowing you to choose to take the backup from one site to another is an additional differentiator that the Veeam and HPE partnership brings to the table. Peer Persistence software allows HPE 3PAR StoreServ systems to act as peers to each other, with both arrays being active, holding primary production volumes and secondary volumes. When Veeam Backup & Replication is configured to use snapshots of secondary volumes, the storage snapshot is triggered directly on the secondary volume, meaning the primary one remains untouched from a backup activity perspective. This technology is not done by Veeam by default but needs to be configured correctly by the user. If you want to learn more about this Veeam configuration, this blog post is a great place to start. Restoring from a storage snapshot can be a difficult, multi-task process taking quite some time, especially if you wanted to restore specific individual or application objects. The Veeam Explorer for Storage Snapshots takes this manual process and makes it much simpler. Through the Veeam Explorer, IT administrators can browse the storage snapshot to perform fast granular recovery of files and application items, even if these snapshots were not created by Veeam itself. Being able to recover from snapshots allows users to benefit from reduced recovery point objectives for application items. Veeam Explorer allows users to perform Instant VM Recovery, file-level restore, application items restore including objects from Microsoft Active Directory, Exchange, SharePoint, SQL Server, along with Oracle databases. Visit our Veeam Explorer for Storage Snapshots tool page to learn more! It’s important to note that Veeam Explorer for Storage Snapshots is available in Veeam Backup Free Edition. This allows you to maximize your storage investments, making storage snapshots more useful in your environment with the recovery features the free edition has to offer. The functionality in the free edition allows you to utilize Instant VM Recovery, which once prompted can get machines up and running in minutes. Additionally, you can restore files and most application items through Veeam Explorer for Storage Snapshots. If you want to learn more about what the free edition has to offer, check out Hitchhiker’s Guide to Veeam Backup Free Edition. The post Veeam & HPE take recovery to the next level with storage snapshots! appeared first on Veeam Software Official Blog. Monitoring data center performance is an essential part of every IT administrator’s job that shouldn’t be overlooked. There are many avenues you can go down when looking at a tool to help monitor performance, but with Veeam, you can do this with Veeam ONE. Veeam ONE has many capabilities, but one of the most important features is the alarm it triggers when part of your virtual environment isn’t working as it should. Pre-built alarms included in Veeam ONE keep IT administrators up-to-date on the operations and issues occurring in their environment in real-time. With over 200 pre-built alarms included in Veeam ONE, users can identify, troubleshoot and react to any issue that may affect critical applications and business operations. 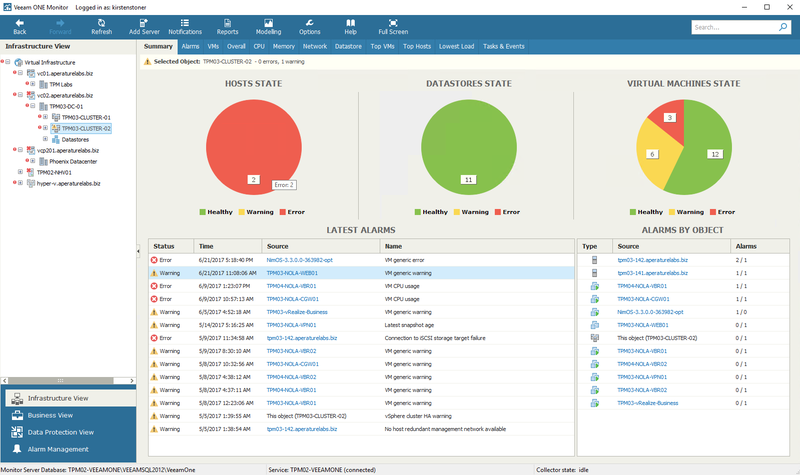 Predefined alarms monitor VMware vSphere and vCloud Director, Microsoft Hyper-V, Veeam Cloud Connect and any internal Veeam ONE issues. Data collection in Veeam ONE occurs immediately after connecting to your virtual center, ESXi hosts, Hyper-V hosts or Veeam Backup & Replication servers. Alarms are based on a set of best practices used to benchmark in comparison with your environment and trigger an alarm when metrics are not aligned. Once an alarm is triggered, users will see details and information in the Veeam ONE console. Some alarms can be resolved manually when triggered and others can be resolved automatically. It is important to note you can modify alarms to fit your business. This includes editing rules, assigning alarms to different objects or creating actions for when certain alarms fire off. Actions created include receiving an email alert on the issue or instructing Veeam ONE to run a script once an alarm is triggered. Within the alarm settings, users can change thresholds or aggregation allowing you to tailor the alarms to fit your business. The Alarm settings wizard is shown above. 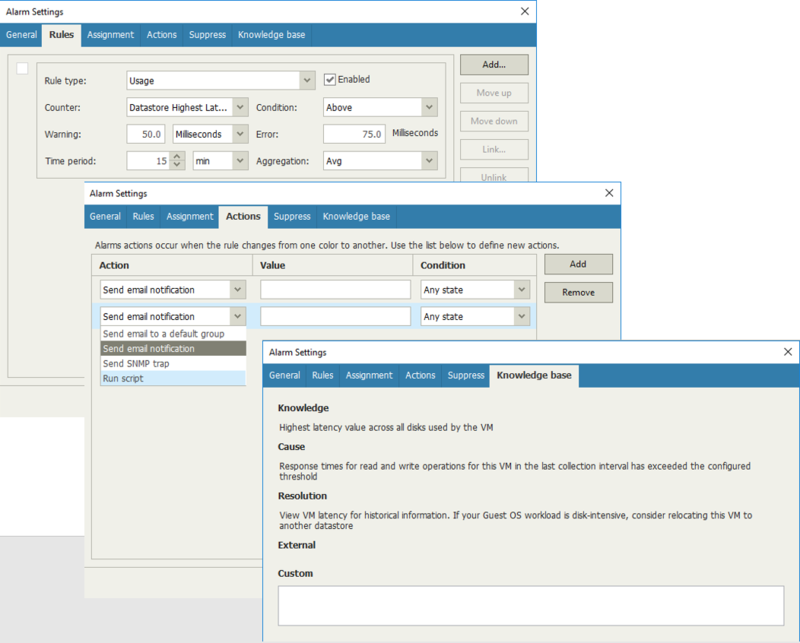 This wizard allows you to adjust the alarm, add different rules to the alarm, enable actions to happen once the alarm has been triggered and allow users to add custom notes on how to resolve the alarm in the knowledge base section. With simple changes, you can set the alarm criteria to be customized for certain servers without affecting other counters in Veeam ONE. There are many Veeam ONE built-in alarms that detect issues in VMware vSphere infrastructure components. The alarms included alert on everything from the vCenter Server, to clusters and hosts, and all the way down to datastores and virtual machines. Veeam ONE will also look at vCloud Director vApps, organization and more. An important alarm that Veeam ONE will trigger is Host connection failure. As the name states, this alarm monitors VMware vCenter Server API for events indicating that a host is disconnected. Similarly, alarms such as Host available memory will inform you when the host is low on memory or Host CPU usage when CPU usage has exceeded the defined threshold. As mentioned previously, there are alarms to detect issues with virtual machines. Some of these include Orphaned VM backup snapshot, High Memory Usage and Heartbeat missing. Along with an alarm to detect high memory usage on the host, there is a High balloon memory utilization alarm notifying you if there is an increased consumption of the VMware Tools memory controller, also known as the “balloon driver,” within a VM. Alarms also detect if there are VMs in your environment that have no backups/replicas. This can help ensure that you are meeting SLAs and will be notified if your backup/replica are not meeting defined recovery point objectives (RPOs). A notable alarm included in Veeam ONE is the Possible ransomware activity alarm, which detects if there is any suspicious activity occurring on the VM. These alarms — plus much more — will provide visibility into your data center to ensure Availability for your business. There are many alarms to help detect issues within your virtual infrastructure, but there are also alarms for your data protection operations. Alarms are configured to warn about events or issues that can cause data loss or prevent Veeam Backup & Replication from working properly. Alarms detect connectivity issues, state of Veeam Backup & Replication components, failing jobs or jobs finishing with warnings, any configuration issues, long running jobs plus much more. Veeam ONE can even detect if your backup repository is running out of free space, which is shown with the Backup Repository Free Space alarm. Alarms identify if something isn’t working properly in your environment, allowing you to quickly resolve and troubleshoot the issue. Veeam ONE provides visibility into the data center to ensure healthy operations for your business. This blog post describes just some of the alarms included in Veeam ONE, but there are many more to help ensure your data center is operating as it should. Veeam ONE is a great tool to utilize in your business, not only for the alarms, but also provides monitoring, reporting and business view categorization. How to benefit from Veeam ONE: Monitoring, performance optimization, reporting and more! The post Get the most of your VMware alarms with Veeam ONE appeared first on Veeam Software Official Blog. Complete visibility within the data center is essential to keeping businesses available 24.7.365. Visibility into the data center allows IT administrators to properly utilize resources, be proactive in troubleshooting issues and run reports on their environment. Veeam allows businesses to remain proactive in monitoring and managing their environment through Veeam ONE. If you haven’t heard about it, you are truly missing out, as it works not only for your Veeam-powered data protection operations, but for entire VMware vSphere and Microsoft Hyper-V environments as well. Veeam ONE helps to optimize the performance, configuration and utilization of virtual resources while providing visibility to fix issues before any operational impact. This blog post will highlight some of the amazing features included in Veeam ONE and how you can utilize them for your business. Veeam ONE gives you the tools to monitor your environment from every view with any level of detail. From the Summary tab to the Top Load and Lowest Load dashboards, users gain visibility down to the VM to see, which parts of the infrastructure are handling or consuming the most resources. To start, the VM tab gives you a brief overview of the VMs in your environment and what you have assigned to them in terms of provisioned space, used space, CPU and memory usage, along with how many vCPUs have been assigned to a machine. If you then move onto the Top VMs/Hosts of the Lowest Load tabs you can see the VMs/Hosts that have been using the most or least resources in your environment. These stats come in handy when reassigning resources, as you can assign more resources to the machines that need them and then also check over-provisioned VMs. These stats are also included in some of the reports that Veeam ONE provides, which will be described in detail later in this post. The alarms that Veeam ONE fires off are a different aspect of monitoring. The pre-built alarms included in the tool allow users to proactively manage environments. Data protection alarms detect the state of the backup jobs and show how many jobs have failed, finished with warning or were successful. Alarms can also detect if jobs exceed backup windows, if the backup repository is running out of free space or notify administrators of connection failures between proxies or WAN accelerators in your environment. Not only does Veeam ONE have alarms specifically for data protection operations, alarms can notify you of errors occurring in vCenter, vCloud Director or Hyper-V. Figure 1. The Veeam ONE monitor. Performance charts within Veeam ONE allow you to analyze aspects of the environment to detect any issues and find the root cause. Consumed resources including CPU, memory, network, datastores and virtual disk performance can easily be seen over days, weeks, months or years. The charts show active, peak and average usage, helping determine how and when resources are being utilized the most. These charts are available for your virtual environment whether you are running VMware vSphere or Microsoft Hyper-V, but you can even utilize these charts for your backup infrastructure components. Under the data protection view you can switch between the different charts, allowing you to identify bottlenecks within the backup data flow. You can track performance metrics for physical and virtual backup servers, proxies, repositories, WAN accelerators or Enterprise Manager servers. Figure 2. 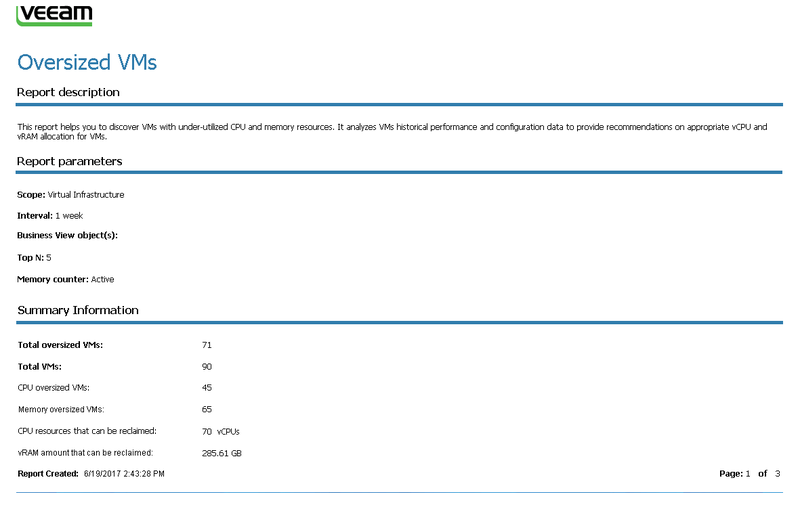 The CPU performance chart included in Veeam ONE. You can see the minimum, average and maximum CPU per object within your virtual environment in the graph above. In this instance, the chart displays the usage from the past week and is highlighting one of the objects where CPU had increased for a short period and then leveled out. This analyzes CPU performance and allows users to monitor usage and take note of peak times. Figure 3. 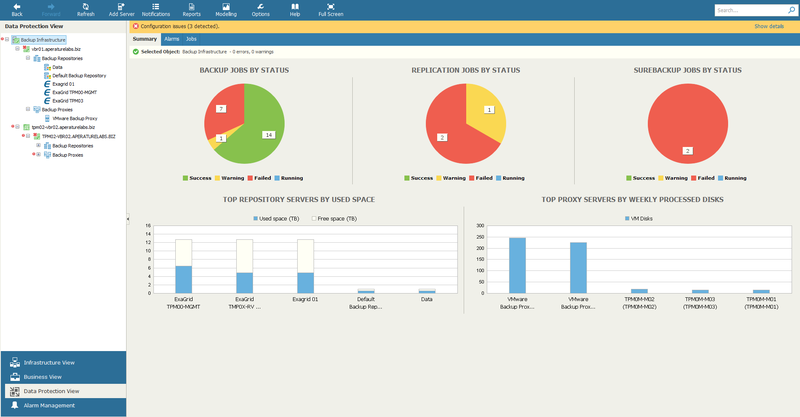 The Veeam Backup & Replication dashboard. 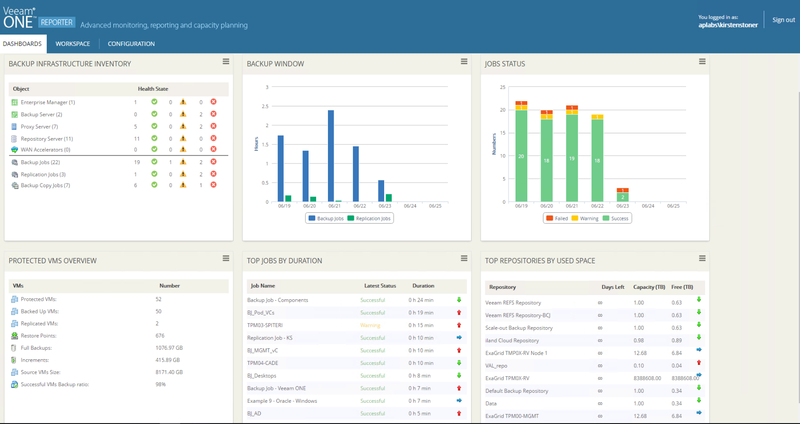 These dashboards can also be customized, which allows users to present the most important aspects of the virtual environment. Along with the numerous dashboards available, Veeam ONE provides reports to analyze virtual environments before backup software is installed or new strategies are implemented. These reports can estimate VM storage usage and daily change rates of VMs, ensure your virtual infrastructure is configured correctly and help estimate future needs for capacity space, among much more. Reports can identify and detect issues before they can affect off-site backup or disaster recovery (DR) for your business. Infrastructure reports are available for both hypervisors that Veeam supports, allowing users to look at their infrastructure before proceeding with backup operations. Reporter can also help identify the costs of provisioned VMs for application owners and business units. This can be helpful to see which units are using the most resources and costing your business the most amount of money. With this information, you can use the optimization reports to reassign resources where needed to get the most of what you have. The Oversized & Undersized VMs report will identify VMs that don’t have sufficient CPU, Memory or RAM assigned to them, allowing you to correctly assign and reconfigure VMs to get the best performance. Let’s look at the Oversized VMs report below. Figure 4. The Oversized VMs report. The report shows the total amount of VMs that are oversized, including if they are oversized by CPU or memory. Reading through the report, you can see the average usage and the peak usage including recommendations on resources you can reclaim. The same information is available for memory usage as well. Along with these reports — to help better utilize resources in your environment — Veeam ONE has Veeam Backup & Replication capacity planning reports to help estimate the amount of space required to store backup files on repositories and help forecast when the amount of space reached its limit. The Capacity Planning for Backup Repositories report helps ensure that there is enough space for your backup data at any point in time, while also calculating the amount of additional space that needs to be provisioned to accommodate necessary restore points. The report estimates this data by looking at historical performance and analyzing performance utilization trends to allow you to rationally plan your resources. There are many capabilities within Veeam ONE to benefit your business and ensure you remain available 24.7.365. With all the reports, monitoring capabilities and pre-defined alarms, you can stay active in your environment and troubleshoot issues before a problem occurs. The tools included can help estimate and determine storage needs through change rate estimation reports along with capacity planning reports. 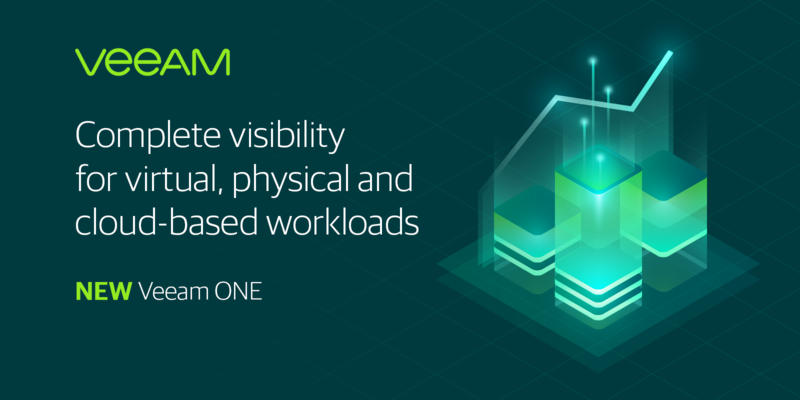 If you haven’t tried this power in action yet — you should, and you can download a FREE Veeam ONE trial here. The post How to benefit from Veeam ONE: Monitoring, performance optimization, reporting and more! appeared first on Veeam Software Official Blog.